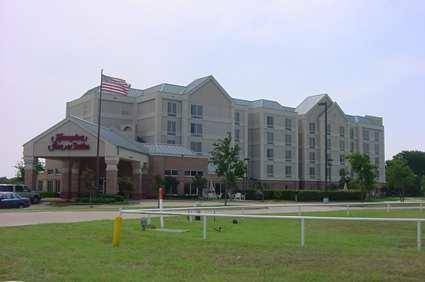 The Hampton Inn - Suites Ft. Worth Alliance Airport hotel is located 15 miles north of downtown Ft. Worth Texas. The Alliance Corridor is home to several large corporations such as FedEx American Airlines Nokia JC Penney Cardinal Distribution 25 minute to Dallas Ft. Worth International Airport and 5 minutes to the Texas Motor Speedway /home of NASCAR races/. A large variety of restaurants are nearby the Hampton Inn - Suites Ft. Worth Alliance Airport hotel. Local Ft Worth Texas attractions include Wineries of Texas and a large shopping mall. The Hampton Inn - Suites Ft. Worth Alliance Airport hotel features 102 rooms fully equipped suites local shuttle service /upon availability/ 24-hour Suite Shoppe exercise gym and outdoor pool. At this Ft. Worth Texas Hampton Inn room amenities include complimentary continental breakfast buffet popcorn and cookies upon arrival in-room coffeemaker hair dryers and cable TV. We also offer connecting rooms cribs irons and refrigerators. Laundry/valet services guest laundromat meeting/banquet facilities and audiovisual equipment are available for a nominal fee. All this and more with our 100 Satisfaction Guarantee. We love having you in Texas at the Hampton Inn - Suites Ft. Worth Alliance Airport hotel. all reservations must be guarantee with a major credit card or advance cash deposit to hotel regardless of time of arrival. all reservations must be cancelled 24 hours prior to arrival unless deposit required. Policy is subject to change. All reservations must be cancelled by 11:59pm the night prior to arrival unless deposit req. If this reservation has been made electronically please cancel it electronically to avoid confusion and a no-show bill. Policy subject to change. - Ft. Worth Cultural Dst. - Fort James Paper Co.
~49 miles from Fort Worth.